This entry was posted in MSV Strings, Strings, Uncategorized and tagged black strings, MSV Focus Hex Plus 25, MSV Focus Hex Plus 38, MSV Focus Hex Soft, New MSV string products, New MSV strings, soft polyester strings by GGTennis. Bookmark the permalink. 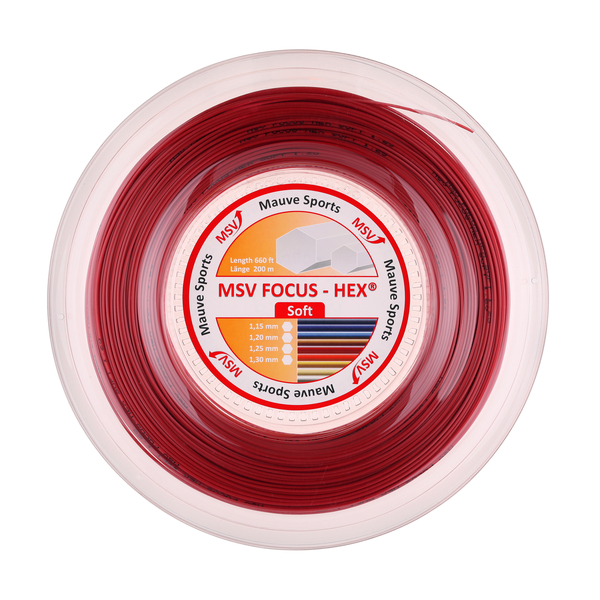 The hottest selling string in the MSV lineup is the much loved and award-winning MSV Focus Hex®. This string represents what is arguably one of the best price/performance values of any string on the market today. The performance rivals and surpasses much higher priced competitors…a fact that thousands of players and schools and top-ranked juniors like Brooke Austin across the USA have already discovered. Not content to rest on the laurels of the MSV Focus Hex®, Dr. Mauve decided to raise the bar. After significant work designing, playtesting and re-designing; MSV is launching several new variations of their flagship string and all will be available in 2013. The first new offering out of the gate is MSV Focus Hex® SOFT. This product hit the shelves at the end of 2012 and has already garnered significant praise from MSV players as well as players switching over from other brands. 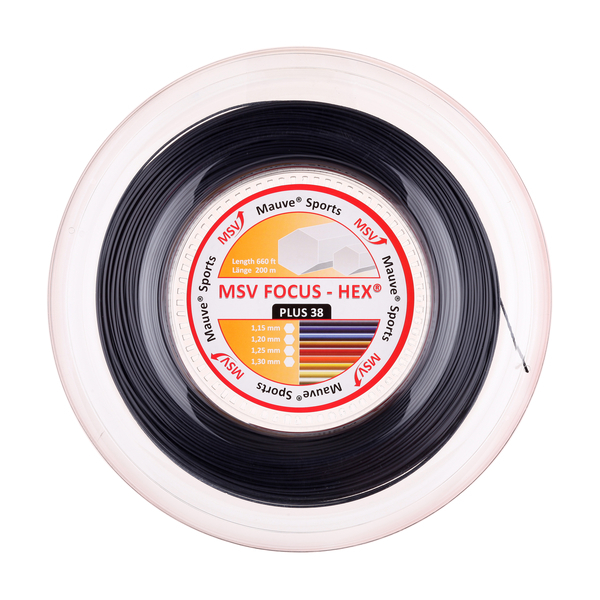 MSV Focus Hex® SOFT is a string derived from the same core materials as the MSV Focus Hex®, but it is 8% softer than the original string. On the court this translates into a more plush hitting sensation. Dr. Mauve was aware that the vast majority of players using Focus Hex enjoyed the crisp comfort the string offers, but some described the hitting sensation as a bit “plasiticy.” The Focus Hex SOFT addressed this issue while providing the same outstanding access to spin and control that MSV Focus Hex users expect from this line of strings. The new MSV Focus Hex® SOFT is available in 4 diameters and most offer a choice of 2 colors. As you may have already guessed from the name of the string, this hexagonal offering measures an impressive 38% softer than MSV Focus Hex® in laboratory testing. The inherent power that players will experience using the MSV Focus Hex® Plus 38 is greater than the original and soft versions of the Focus Hex, but at the same time the control is there to keep the power inside the lines causing significant problems for opponents. In previous years softer poly-based strings were unable to maintain their playing properties, but playtesters and tests verify this is not a concern with the advanced materials used in the construction of this exciting offering from Mauve Sports. Players who previously complained about the feel of poly-based strings are going to be scratching their heads in disbelief when they get a set of this in their frames. The comfort level is at a threshhold where many users will have difficulty distinguishing it to be different than synthetic gut offerings. At the same time they will realize greater spin and control than they have ever experienced with a traditional synthetic gut string. The MSV Focus Hex® Plus 38 can be blended with synthetics, but adding comfort would not likely be a reason for this type of hybrid combination. MSV Focus Hex® Plus 38 will be offered in 4 gauges and multiple colors beginning February 2013. While the MSV Focus Hex® SOFT and MSV Focus Hex® Plus 38 are the first two new offerings to hit the shelves, there was one additional breakout string in terms of playtest results that is also coming soon. This string is projected to be available later this spring. It is called MSV Focus Hex® Plus 25. As you have correctly surmised, it is 25% softer than the original MSV Focus Hex®. There were several playtesters who appreciated the added comfort and power the MSV Focus Hex® Plus 38 offered, but preferred just slightly more crispy hitting sensations. The MSV Focus Hex® Plus 25 delivers this exact level of performance. This specialty string will initially only be offered in 2 diameters 17ga (1.25mm) and 17L ga (1.20mm) and will only be available in a single color – – black. Exciting things are happening with MSV string products in 2013 and we hope you will consider playtesting them to determine if they are a string that can help you reach your full playing potential on the court. We believe like thousands of players already firmly situated in the MSV camp, that you are going to love them! I was wondering if I may use your very good write ups and info describing MSV strings here in South Africa on some websites? I want to start the retail destribution for Dr Karl Mauve here in SA . I will of course quote your website and business as reference. Albie, No problem. Wishing you well with MSV strings. They are awesome.